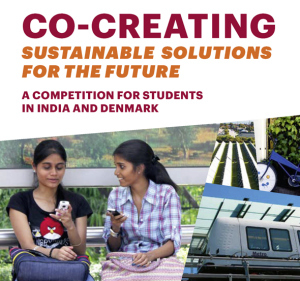 Indian and Danish students of business, technology, design/urban development, and arts/culture are invited to generate and present innovative ideas which foster Indian–Danish co-creation in their respective fields. The submitted ideas must contribute to sustainable and inclusive development in India and Denmark. Awards for students: a trip to India/Denmark with a brief internships at Indian/ Danish companies and institutions. Innovative ideas for green and inclusive development are in the forefront for developing successful solutions in business, technology and design, and for artistic and cultural attention. Furthermore global solutions where partners, producers and users from different parts of the world co-create based on their comparative strengths are needed. The competition is open for submissions until 15 December 2012 and is followed by a programme in India in late January 2013, where awarded students can present their ideas. Students can get inspiration for ideas at the website www.cocreatenow.org and submit ideas atcocreatenow.org/competition-entry. The competition is arranged by the Danish Cultural Institute as a part of the ‘India Today Copenhagen Tomorrow’ initiative, which takes place between August 2012 and January 2013.